La Svolta is in Cecil Street, a small street off Chapel St. This is not a restaurant that the casual passer-by walks past and spontaneously drops in for a meal. People know about La Svolta and seek it out. The evening we went, it was mid-week and those in our immediate vicinity were a young Italian couple, an older Italian couple, a family with 3 teenage children, and a table of 4 of early 30’s women. The restaurant attracts a diverse demographic, but what they seemed to have in common was a relaxed passion about food. The relaxed passion is infectious: it starts with the waiting staff and spreads to the diners and is very evident in the kitchen. The chefs are from different parts of Italy and are given a free reign with the daily specials to indulge their passions. The specials, in particular, show case regional dishes in a most authentic way. The food is very much regionally and seasonally driven. The ambience of La Svolta is quietly bubbly. There’s an exposed red brick wall, a large window overlooking the street, a grey concrete floor, a black ceiling, black tables and chairs, subdued lighting and soft jazz/blues music. There’s plenty of space between tables so the various diners make the evening to their own design: serious foodies, romantic meal, and a family feast of pizza. 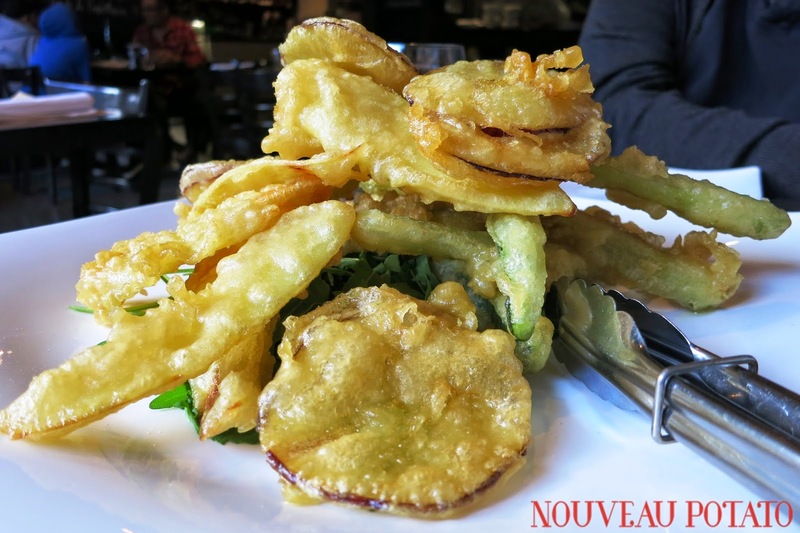 The first course was a platter of vegetables deep fried in a batter and accompanied by a balsamic reduction. The platter consisted of potato, zucchini, and apple. The batter was as light as a feather and allowed the flavours of the vegetables to emerge. The different flavours worked well together, and the balsamic balanced the light batter. This was an unusual dish but a great start to the meal. My main course was a risotto, asparagus and taleggio. The risotto had a slight firmness, the asparagus a slight crunch, and the cheese created a delightful creaminess. This was a simple dish but the cheese created a creamy sauce which made the dish unique and delicious. The dessert was a chocolate cake. 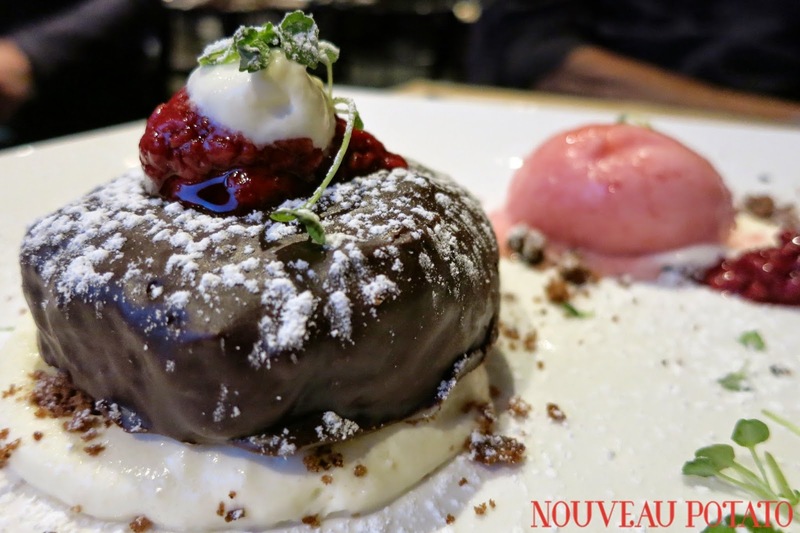 This was a well-constructed dessert with a dense chocolate cake accompanied by strawberry gelato , mascarpone and fresh raspberries. The cake was a rich finish to a very enjoyable meal: it was sensible idea to share the dessert. The closest thing to travelling to Italy? Surrounding yourself with Italians of course. Invited to La Svolta for dinner, I stepped into a restaurant I had walked past many times and about which I had wondered. Spacious, modern, Tuscan, with Italian food, wine, language and looks – it was a brief interlude into familial Italian life. We were dining early, others were too with their kids still in uniforms. I sat, facing the restaurant (Italy), my back to the window (Australia). We began with fried apple, potato and zucchini as a shared starter. It looked like tempura but the batter was more like that of a potato cake. The batter held a crisp and crunch with cooking in hot oil and being drained before serving. The potato was soft inside. The red apple was thinly sliced and like chips for the extra thin ones – this went deliciously with the reduced balsamic as a sauce. Rocket sat underneath, adding to the visuals rather than being a condiment. I do not usually like zucchini, but this was disguised by the crunch of the batter. Michael liked the potato best, the apple was my standout. La Svolta is one of the four places in Melbourne with AVPN accreditation – marking it as a maker of true, traditional Napolitana pizza. The eggplant pizza was aptly recommended. 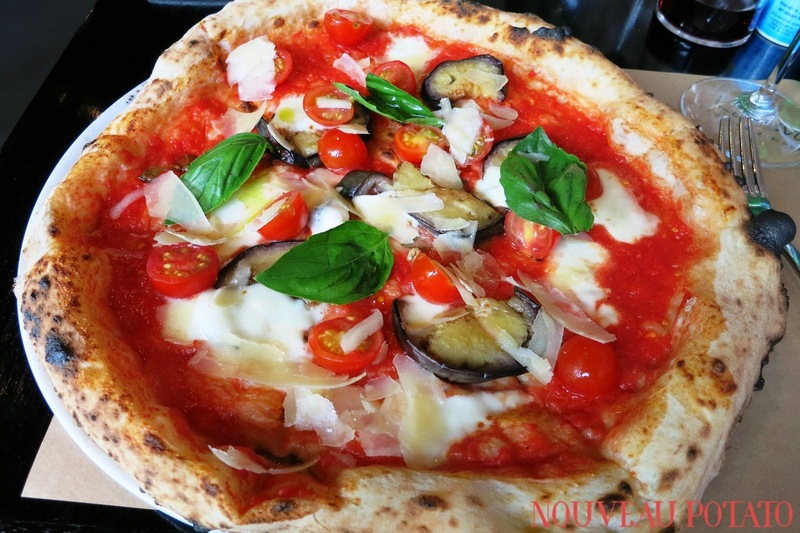 It was served with freshly made tomato sugo, oily eggplant and mozzarella this had been cooked in a traditional oven. Raw basil, cherry tomatoes and parmigiano were then placed on top – all very fresh. The base was chewy and charred with puffy edges, too thin to hold a whole triangle without it collapsing. For wine, we tried a small carafe of Chianti. It was served in nice glasses but was very closed upon pouring. By the time we got to mains, the wine had opened slightly to give aromas of sultanas and soft fruits but was still too young and tannic. 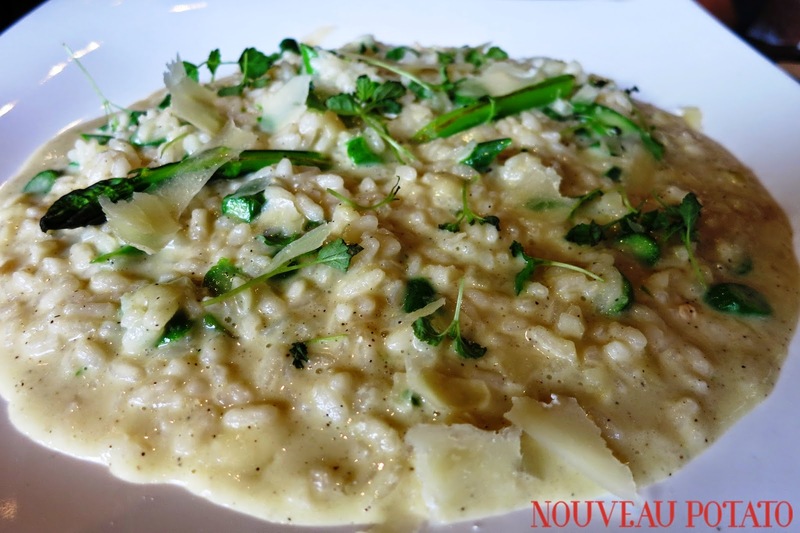 Michael ordered the asparagus and taleggio risotto, which was al dente rice, a creamy sauce and a balanced flavour of the cheese giving it a more-ish appeal. Next to us were two young Italians. The girl ordered a garlic pizza, letting wafts of garlic tempt us. We were full, our plates were almost licked clean...but we were still tempted by dessert. The name “chocolate temptation” or “tentazione al chocolate” encourages certain sentiments. It was a chocolate cake, covered in chocolate and served with poached raspberries, strawberry sorbet and cream. It was like a home-made dessert that one would find in the Tuscan country-side. The cake had been refrigerated. The presentation was perfect.